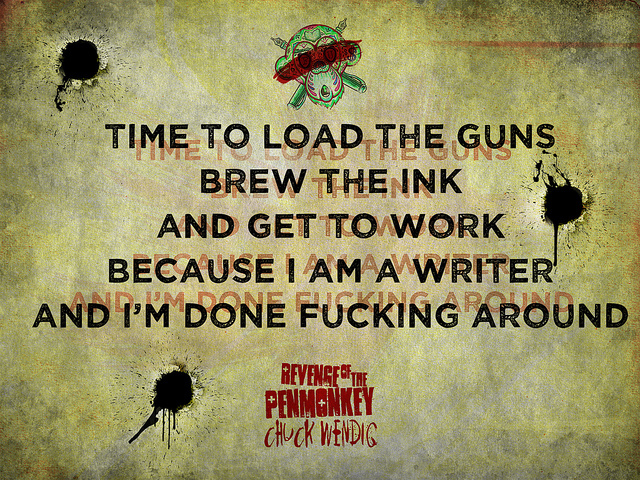 Chuck Wendig’s got a flash fiction challenge over at his blog, Terribleminds. The challenge was that you’ve got 1000 words to describe someone making a sandwich. My piece is a bit shorter at 635 words, but it says what needs to be said. Enjoy. He mumbled something unintelligible, which she took as a yes. She hopped off the bed and walked to the kitchen, hips swaying to music only she could hear. The GE fridge wept rust stains down its sides and moaned like an old woman when she hauled its door open. She stood illuminated in a pool of butter colored light. Auburn curls tumbled down her back down to the spot that he had kissed such a long time ago. He could see her profile, the pert little nose and plump lips, hiding teeth that could inflict such pleasure and pain. She stuck her head in the fridge’s cavernous depths. “Mmm, let’s see. You don’t mind day old cold meat, do ya?” Her voice was muted but he still heard her and pretended not to. She exited the fridge, carrying a white plate. “It’s bone china, all the way from the real China,” she chatted as she moved around the kitchen, collecting bottles and tins and bread from the bin. “Now let’s see,” she stood with one hand on a hip cocked to the side and the other hand’s fingers tapped her lips. “Where did I put that knife?” Annoyance tinged her voice as she looked around the table. “Oh, never mind, it’s more fun this way,” she giggled and broke a Panini in half. She scooped a handful of mayonnaise from a jar and spread it out; her fingers massaged and pushed the white, creamy substance into the bread. She was distracted for a while but then noticed the sandwich again and gave it a bright, cheery smile. “Almost done!” She grabbed the bone china plate and carefully lifted the clingwrap away from the meat. A big, green blow fly crawled out of the plate, shook its wings and buzzed off. “Ugh,” she cried and swatted at it. “A bloody fly!” She ran around the kitchen, curls bouncing and arms waving, trying to chase the fly away. She put the sandwich onto a plate and balanced it on one hand, vegetable peeler in the other hand, and walked over to the bed.